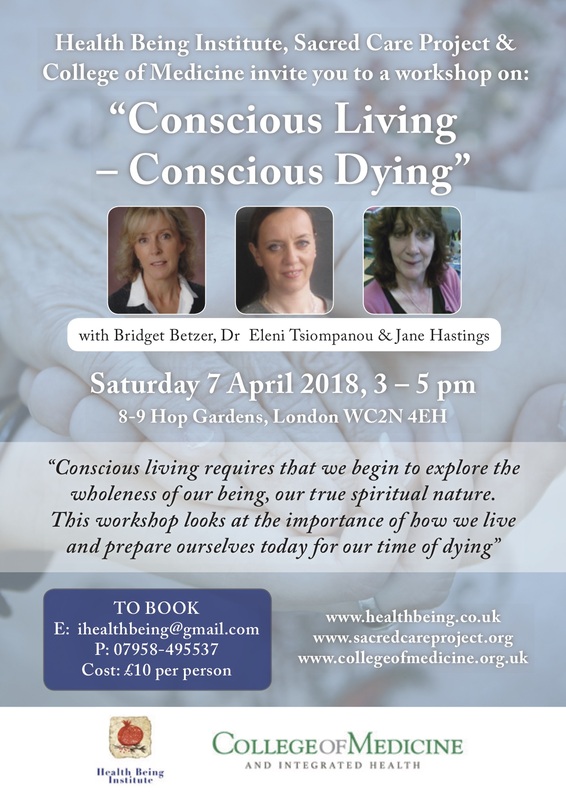 Health Being Institute and the Sacred Care Project, in association with the College of Medicine are presenting a workshop to investigate the importance of how we live and prepare ourselves today for our time of dying. We all need to be thinking about our life/death decisions and choices, sooner rather than later, and how we might take responsibility to care for ourselves and our loved ones when the time comes that we/they are dying. By starting the conversation about death and accepting our spiritual nature, we become part of a community of people who inspire each other to live consciously and prepare for our time of dying. Bridget Betzer has been a nurse and longtime caregiver. She began the Sacred Care Project in 2015 in response to the fear and unpreparedness she witnessed many times when caring for the dying and their families. She feels that with the right guidance and support we can be part of this very natural holistic process in a helpful, healing way, a sacred way.